Adopting heavy duty steel beams structure for a solid foundation of high resolution and high speed printing. 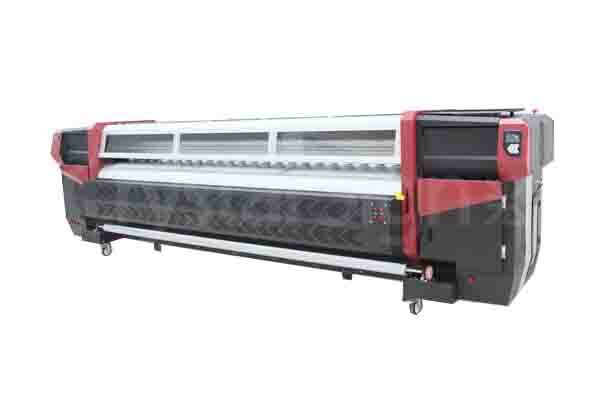 Super-wide aluminum printing platform with molding making, adopt print heads of SPT 1020 and 510_35pl ensure the productivity of printing. 400W high power AC servo motor control sysytem ,with long life,high accuracy and quick response. The power of medias absorbing can be adjusted, which allows printer adopts varied different kind of medias. • امکانات نرم افزاری دستگاه، این امکان را به شما می دهد که پس از قطع جریان برق نیز با استفاده از UPS قادر به ادامه چاپ باشید البته پس از بقراری مجدد جریان برق. بنر – فلکس – وینیل – استیکر – PVC – مش – سولیت و . .
Automatic ink supply based on auto-detected ink level, failure alarming,empty main tank prompt. One key positive-pressure ink injecting, adjustable force of media being absopted to platform, anti-warp media-press,subtank heater(optional),lighting for head cleaning, drying fan, anti-splash board, emergency stop,full waste tank prompt.